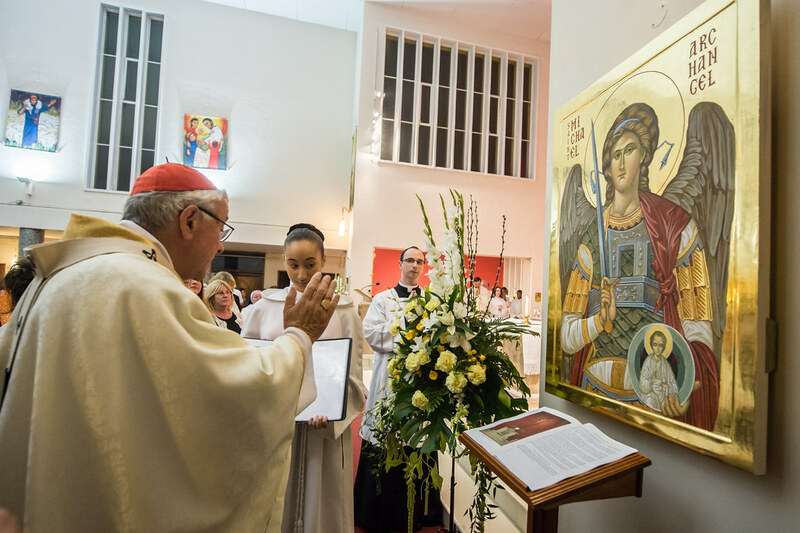 The feast of Our Lady of Sorrows 15 September 2016 saw the Consecration of Our Lady and St Michael, Garston, Hertfordshire, celebrated by Cardinal Vincent Nichols, Archbishop of Westminster. To mark the occasion, Fr. David Barrow, parish priest, commissioned Mike Quirke to paint an icon of the patron St Michael the Archangel. . The icon was made using traditional processes and materials including gesso on limewood panel, 24 carat gold, and egg tempera. It was produced over a period of 5 months from May to September 2016. The icon was installed in the week leading up to the consecration. Even at this point the icon is not yet completely finished as the varnishing process is delayed until the tempera paint is cured after a period of 6 months to a year. On the evening of the consecration the assembly comprised a good mixture of parishioners, clergy and visitors. At the end of the celebration just before the final blessing the Cardinal blessed the icon. This week saw the launch of St Patrick’s Studios website and a celebration in the Old School Hall with friends and invited guests. The site was put together by David Fairbairn Mike Quirke and Alice Robertson. The site includes profile pages of the 10 artists in residence and the studios history dating back to the primary school closure in 2002. It was at that time Fr Digby Samuels the parish priest had the idea to form a Christian Centre for the Arts in the old school building. The page of resources includes notes of talks and seminars and a list of recommended reading among which are the letters/homilies to artists from the Popes of recent years including a homily to artists given by Paul IV in the Sistine Chapel 1964. This document is of interest as the first online english translation thanks to Andrew Kelly who translated from the Italian making this a St Patrick’s Studios EXCLUSIVE! There is a smaller version of the Merciful Father currently for sale in The Catholic Truth Society bookshop in London Victoria. It can also be found on their website here. Oremus Article (see Magazine page 9 or PDF page 5) written by Mike Quirke on the Merciful Father icon in Westminster Cathedrals Way of Mercy. Oremus Article (see Magazine page 19 – 22 or PDF page 10-12 ) written about Westminster Cathedrals Way of Mercy. With Mike’s Merciful Father as the front cover of the magazine (pictured below).